If you have spent much time in support groups for abuse survivors, you probably already know this: good parents often lose custody of their children to their abusers. It is sickening, but it is true. The custody battle I endured was a nightmare come true, and the stress of it all probably took years off my life. Literally. I have a long story to tell about it, but I haven’t had the heart and bravery to sit down and write it yet. And I won, which means I had a happy ending. Many of us do. Some of us don’t. Narcissists and abusers are controlling. They are more likely to fight and they are more likely to win if they do. 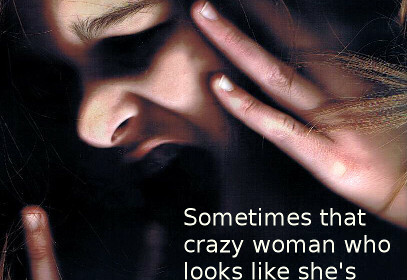 As I was told by an attorney I consulted, the abuse survivor will often seem “crazy” and will show poorly in a psychological evaluation, while the abuser will remain calm. No one terrorized the abuser, so they don’t have the fears that the victim has. People who marry abusers were often previously abused by at least one of their parents. So, they are already carrying some trauma with them. (I had the trauma of having two narcissistic, addict parents.) Even without childhood abuse, people who marry abusers are going to be traumatized. The more you’ve been abused, the more damage you could have. People who have been abused are more likely to be depressed, anxious, stressed, and more. A judge or psych evaluation can very often interpret the signs of your trauma as a personality disorder, or they could believe you are the abuser. If you’ve been abused, you will probably be angry, frustrated, scared, hyper-alert, and have other stress-related symptoms. 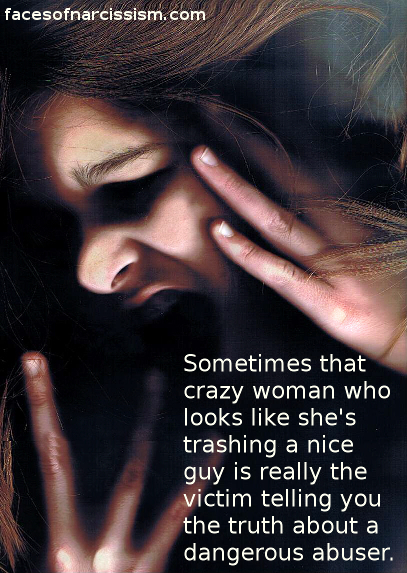 Plus, narcissist and sociopathic abuse is so intense, that it sound unbelievable to some people. So, in court, you may have PTSD, you might be shaking with fear, your voice might rise and your pulse race as you testify and re-live the abuse. Your thoughts might rush together until you are rambling and trying to fit in details of years of traumatic abuse. You will have a hard time being calm–especially when you are scared for your child’s safety, and you might look like you are the “crazy” person your abuse claims you are. The judge, the GAL, and a psych evaluator will be more concerned that you show the effects of abuse than they are concerned that the abuser did these things to you. Plus, there’s the insanity of “parental alienation” claims. If you try to keep your abuser from being alone with your child, (with good reason,) you will be branded the abusive parent who is trying to destroy the other parent’s rights. Many good parents lose custody for this reason alone. The abuser’s right to the child is put ahead of the child’s right to be safe. When I first started reading support pages, I got so frustrated by all the horror stories I read. One day I posted saying “why are all of these stories so bad. Can’t anyone share a good story to keep our hopes up?” Then I left the group. Although my abuser refused to meet my son for a long time, then barely ever visited, we kept going to court about visitation and child support. The judge didn’t want to give us a final order until the sociopath was stable in one location, (which never happened.) So for several years, I walked on eggshells in fear of what would happen when we got to the details of custody. Then one day, my worst fears came true, and my kids were taken from me. I thought I would die. I live in hyper-arousal for weeks and couldn’t calm down. I couldn’t think of anything else. In court, I was called “hysterical” because I tried to get the court to understand what was going on and I cried for my kids. The court created the situation, then acted like I was crazy for reacting! This is a long story, and it’s going to take more than a blog post, but I want to emphasize that this happens. This is real. There is reason to be scared. However, as terrifying as this reality is, it is your fear, your anxiety, your desperate attempts to be heard…that will lead to a judge thinking you are unstable. As my attorney told me, (she was a no nonsense woman,) none of this was fair, and yes, these people could do whatever they wanted while I was helpless. So, she told me, I had to play along. I had to do everything I was told to do and accept things as they were so that I could calm down and get myself together. I hated all of it. I wanted to tell someone off and let them know just how wrong they were and how dangerous the decision was. But, even though I was right, I could not do that. I had to stay humble and bite my tongue. In court, I couldn’t discuss every nasty thing the abuser said and did to me. No one cared. Instead, I had to focus on hard facts such as the reality that I had a stable home and job while the abuser was jobless and living off others. In time, the abuser showed a tiny bit of his true colors, and just that hint turned the tides. In the space of a day, the court was scrambling to return my children to their home. The judge still doesn’t understand that I’m dealing with a sociopath, but I have custody for technical and unemotional reasons. It is scary that I didn’t win based on his criminal and anti-social history. I won because I played along and humbled myself before more powerful people. The narcopath couldn’t do that because his ego is so huge. As an old quote says, it is better to be happy than it is to be right. I would have been right if I’d told every court official in the county how wrong they were. I would have been right if I’d been defiant and insisted on being heard. I would have been right if I’d refused the court-ordered therapy I had to attend because they thought I was alienating. But, like my attorney said, I had to play *their* game. And it paid off. My kids are safe. The worst of this hell lasted for a matter of months, but did long-lasting damage to myself and my children. The court doesn’t care. There was no apology for the financial destruction, the PTSD, my children’s fears, the lost birthdays and mother’s day. The only words I ever got were “I guess we had to see it for ourselves.” Some days, if I focus on this, I get depressed about all I had to endure and lose, but I focus on the happy ending. I went through hell, then it got worse, but it is okay now. In fact, the outcome actually helped me because if the abuser tries anything again, I already have a solid case against him because of the way he behaved. Small silver lining. My kids are thriving, and I keep going.